o Dig Deeper with Angus and Tino: the perfect Mother’s Day gift. Visit our beautiful site and learn about the vision for our ecovillage. A short presentation by our founder,Lyndall Parris, or other members, with Q&A will follow a walking site tour of our rural property. Bring enclosed shoes and hats. Tea/coffee, water, and a seasonal fruit platter will be available. Please feel free to bring along your own lunch or afternoon tea to enjoy. Dirt is Good – Dirt is Healthy: why every kid, should be eating good soil!” is the title of Peter Rutherford’s (photo above) talk at the Mad About Dirt event at Narara on Saturday 11th May. Peter, from Kimbriki Environmental Enterprises, is a horticulturist , an educator with an extensive knowledge of soils and microbes and is known as a terrific and inspiring speaker. He argues that good healthy, organic soil contains billions of beneficial microbial species that assist humans to build up strong, healthy immune systems. Citing Dr Mary Ruebush, he says: “Contact with, and ingestion of, these beneficial microbes is critical to long term human health” he says. “Parents should relax. Kids who play outdoors and get dirty are healthier. They get plenty of physical exercise, and just as important, they get plenty of immunological exercise. It is possible that our current obsession with cleanliness is actually counterproductive to health. Let your children eat dirt, and avoid antibiotics whenever possible”. Peter is one of a fabulous line up of speakers and exhibitors at Mad About Dirt. Mad About Dirt is a day dedicated to discovering more about soil, and meeting people who really are really “mad” about soil. Speakers include Tino Carnevale from ABC TV’s Gardening Australia program, author and television presenter Angus Stewart, Permaculture expert Kerrie Anderson and local farmer Virginia Mallfrom Grace Springs Farm who practices regenerative, non-chemical agriculture. Mad About Dirt starts at the Narara Valley High School at 9.30am and then moves to the Narara Ecovillage from 1 to 4 pm. As well as hearing talks and panel discussions, people can visit the High School Farm and the Ecovillage itself, where they can see homes being built with natural “dirt” materials, as well as a permaculture garden and food growing trials. Admission to the event is free, thanks to generous support from the Central Coast Council and local sponsors. Mad About Dirt: BYO soil and dust samples for free analysis! Would you like to know if your house or garden are contaminated? We are very excited to announce that Macquarie University’s Vegesafe Program will be attending Mad About Dirt on Saturday the 11th of May. At the High School in the morning (9.30 to 1 pm) they will accept any soil or vacuum dust samples (that you have previously collected from your home) for both their VegeSafe and DustSafe programs. They then take the samples away for analysis, and then send you a report. The analysis is free! Please look up both the VegeSafe (https://research.science.mq.edu.au/vegesafe/) and DustSafe (www.360dustanalysis.com) websites prior so that you can collect your samples at home following the correct procedures. In association with the Mad About Dirt event, Builtsmart Modular of Lisarow are offering a $8,000.00 scholarship for local secondary students to design modular gardens. Mad About Dirt organiser Joan Cassels asked Builtsmart Modular if they would provide funds for a scholarship instead of providing sponsorship. The scholarship is open to year 11 and 12 students of Narara Valley High School and Lisarow High School. They must work in pairs, and design gardens that can be made at the Builtsmart factory in Lisarow and are able to be delivered with Builtsmart homes. The students must understand soil, the care that is needed for modular gardens, and what plants to grow and how to grow them. Application forms are available at Narara Valley High School from Deputy Principal Kerrie O’Heir. Photo below. Narara Valley High School Deputy Principal Kerrie O’Heir and Builtsmart Modular General Manager Sean O’Hara announcing the scholarship. Angus Stewart and Tino Carnevale are the keynote speakers at Mad About Dirt event on Saturday, 11th May at Narara Valley High School in the morning and at the Narara Ecovillage in the afternoon. However, for those who would like to spend more time with these talented and knowledgeable gardeners, there will be a special session on the following Sunday morning, called “Dig Deeper with Angus and Tino”. It’s the perfect Mothers’ Day gift! “Dig Deeper” will be on Sunday, 12th May in the Narara Ecovillage Visitors Centre, 25 Research Road, Narara, NSW 2250, from 11am to 1pm. Come with your questions about topics such as gardens for wildlife, growing your own food and your favourite vegetables, kids in gardens, soil conservation and climate change, agricultural practices in Australia-or just because you love trees and butterflies! BYO picnic lunch for afterwards, or book your local restaurant table for 1.30pm and avoid the rush! To learn more about Tino, go to https://www.abc.net.au/gardening/factsheets/my-garden-path—tino-carnevale/10945254. For more on Angus, former Central Coast resident and now climate refugee in Tasmania, go to Gardening with Angus. https://www.gardeningwithangus.com.au.). NB Angus’s first job was at DPI Narara! Angus will be available to sign his books like Grow Your Own: How to be an Urban Farmer (with Simon Leake), and The Australian Native Garden, A Practical Guide (with A.B. Bishop). Photo below: Angus Stewart and Simon Leake are joint authors of Grow Your Own: How to be an Urban Farmer. They will both be presenting at Mad About Dirt. My owner-build hemp house is ticking along slowly but steadily. After a 5 month wait my double-glazed Murray River red gum windows and doors have been delivered and installed. I think they look brilliant and well worth the wait. My roof is on and we are now all ready for the hempcrete workshop starting on 13 April with a rendering workshop to follow about a month later. I expect to be at lock-up stage sometime in June. We love our house – it worked well in summer keeping out the heat and now as the nights cool it’s lovely and warm. The valley is spectacular and we’re enjoying the differences that the time of day and the different weather make. We’re slowly getting our garden shaped – paths have been made, walls are now being built and, a few trees and a habitat garden have been planted. It’s been pretty seamless slipping into village life, we’re able to enjoy the company of other members as we walk around the village and it’s a treat to be able to slip home to relax when we need to. At lot 9, we have at last got the house slab in place but work continues on the carport foundations and retaining walls. One lesson was to get the slab done asap after breaking ground because of the impact on the site that regular heavy rainfall makes. It took us some time to work through the structural issues after starting with a very conservative foundation design. A lot of money was saved by reviewing all aspects including soil conditions after excavation and reducing the need for all those screw piles. Working full-time and commuting to Sydney from the Central Coast, I am very happy to have chosen a local builder to take on my project. When finished, my mostly natural house will be a mix of hempcrete, rammed earth and cob. The team started just after Christmas break and even after 3 weeks of consistent rain, my home is still on track for completion in late July/early August. My roof will be on next week, weather permitting. Making decisions on the fly has been great fun and I am finding the experience really rewarding. In the month since our hugely successful workshop, the Viva Homes team has made great progress on our home and the end is in sight! External renders and cladding are complete, internal render finish coats are nearly done, timber flooring is down and windows and doors are installed. We reached lock-up a couple of weeks ago, however the high humidity and rain has played havoc with our lovely Blackbutt timber windows and doors, causing them to swell and not close as they should. We’re unsure about the solution, but in the meantime, we’re hoping the rain will move elsewhere! Next on the cards are kitchen, laundry and bathroom fit-outs and we hope to be moving in sometime in May. The Earthship will have its final exterior coat of render on 17th May and I hope to apply for an occupation certificate the following week. I anticipate having a workshop to put in the wicking beds in the greenhouse section of my house, and will finish the interior soon after. The wet room floors will be tiled next week and then the concrete floors will be polished. It’s been 8 months – nearly there! If you are interested in participating in any upcoming workshops (rendering, hempcreting, etc) over the next few months, email network.news@neln.org.au to be invited when dates are known. Congratulations to member Jazz for achieving a 9 star NatHERS rating for her house design. This is a village first and shows that what can be achieved even when operating with a very tight budget. Jazz’s one bedroom 60sqm house, designed by Living Green, is fully functional but has not sacrificed the importance of achieving overall energy efficiency. We look forward to seeing Jazz’s design sailing through the council DA process. A ground floor, one-bedroom unit with your own private terrace – easy maintenance living in close proximity to the village heart. A top floor, one-bedroom unit with a private balcony and view – easy maintenance living in close proximity to the village heart. $360,000 – Lot sale $330,000 and Co-op membership $30,000. A relatively level lot in close proximity to the heart of stage 2 including community facilities and right next to our very own Earthship on Gugandi Road. A flat lot closer to nature, away from the Village Heart, located in a prime position, with excellent views, overlooking the food bowl area, that will never be built out. It has a north easterly aspect and comes with two different sets of house plans already at development consent level. Price includes community facilities. Visit Narara Ecovillage for a day of sustainable houses (save the date). Talks throughout the day and much more. Member Scilla Sayer brings Exciting News: Thanks to the initiative of Gina Price, pioneer for Sociocracy in Australia and external Board Member, and Lyndall Parris, our Founder and determined advocate for Sociocracy, Narara Ecovillage will be part of the Sociocracy for All International Online Conference on. Sociocracy is a model of governance and decision-making that evolved from consensus but avoids the potential blocking of an outcome by one dissenting voice. It enables everyone to have input around issues that affect us all. We aim to achieve outcomes that ‘we can live with’ which are ‘good enough for now’ and ‘safe enough to try’. Sociocracy shapes our organisational structure and influences the spirit in which we approach planning, doing and learning at every level at the ecovillage. It is the way of working together that is now being adopted in many ecovillages co-operatives, non-government and not-for-profit organisations, schools and community groups. At Narara, Sociocracy principles and practice are taken seriously and enthusiastically and enjoy discussing experiences with interested folk. As one of two Australian presenters at the conference, Gina and Lyndall will include video clips from nearly 20 members. It will be very ‘real’ and share both successes and stumbling blocks. Topics we touch on will range from Master Planning to Managing Pets at Narara Ecovillage in collaborative, creative ways using Sociocracy. Escape for a magic day to a peaceful rural venue in the heart of Narara Ecovillage to explore what makes a sustainable yoga practice in a sustainable environment to create a sustainable life…spirit in action in simple ways both on and off the yoga mat. Led by Mark O’Brien (yoga teacher and founder of Qi Health & Yoga) your day will guide you to explore truly sustainable yoga practices to suit YOU and the life direction you are taking now. It’s suitable for anyone regardless of yoga experience, injury or other “limits” often placed on practicing Yoga. * Expect a (moving) morning and (gentle) afternoon yoga practice to develop techniques and manifest the “Self-Care” we so often forget. * Expect to reframe why and how you “do” Yoga. * Silent forest walk and meditation in the ancient State forest and arboretum next to the venue. * Chance to tour the newly-emerging Narara Ecovillage for inspiration how to live your daily life with purpose and embody the principles of SUSTAIN-ability back in Sydney. Mark and his wife Nicky are members of Narara Ecovillage and are restoring the “Heritage House” to be more environmentally sustainable and livable. Join us on Friday, 26th April at Narara Ecovillage to learn what you can personally do about Climate Emergency. Jane Morton, Clinical Psychologist and Climate Emergency campaigner, is coming up from Melbourne to train us on how to communicate effectively on the issue of climate emergency, and has taken on the role to travel around our country to teach how we get more people to listen and take effective action. Her publication ‘Don’t mention The Emergency’ gives much food for thought. The Guardian reports: Regional forest agreements have failed in the 20 years since they were established by state governments, says a new report, which reveals that record numbers of threatened forest dwelling fauna and many species are heading towards imminent extinction. There will be a diverse selection of works by our members of both framed and unframed paintings, and hand-painted cards – all original. Danni Liu, member and featured artist, has gifted her beautiful painting “Out to Work” as the raffle prize to be won by one lucky art lover. Listen to this fascinating piece on ABC Breakfast show (about 28 mins in), interview with Robert Llewelyn, and link to his ‘fully charged’ youtube show to keep in touch with electric vehicle developments in Australia and overseas. Walk along five wonderful Central Coast Beaches: McMasters, Saratoga, Avoca, North Avoca, Terrigal and be entertained along the way with music, dancing, art & photography exhibitions, sculpture on the beach, food, good company and healthy exercise. Come along and experience making BD500 at Warrah Farm in Dural (20 Harris Rd, Dural, NSW 2158). It’s a free and hands on workshop. Please wear old clothing/gear. The Warrah Biodynamic farm shop will be open. Also bring some extra food for sharing during lunch. See you at the ecovillage! The Narara Eco Living Network is a not-for-profit educational and outreach body established by members of Narara Ecovillage to promote more sustainable living in all its forms. Become a supporter of the Network – 12 months membership is only $20 an individual or $40 a family. Networkers are offered discounts to a variety of events at the village, and free entrance to Open Days. Click here to check out upcoming events. The network is 100% run by volunteers so we really appreciate your support! Please reply to this email, and write the word “unsubscribe” in the body of your email. Walk in Strickland Forest or spot wildlife by torchlight! Mud Floors and Much More! Visit our beautiful site for an afternoon and learn about the vision for our ecovillage. On arrival enjoy walking tours around the site until 2pm. Then there will be a short presentation by our founder, Lyndall Parris, and a Q&A session. For safety, enclosed shoes are recommended (not thongs or sandals) and please leave your pets at home when you visit the ecovillage. Dates: 31st March, 27th April, 29th June, 28th July, 25th August, 27th October. Meet some people who are really mad about dirt. Virginia Mall from Grace Springs Farm will be at MAD. Peter Rutherford, Senior Ecologist at Kimbriki Environmental Enterprises, will speak on ‘Dirt is Good – Dirt is Healthy: why every kid, should be eating good soil!”. Peter is a horticulturist and educator with an extensive knowledge of soils and microbes. Simon Leake, Managing Director of the Sydney?Environmental and Soils Laboratory (SESL), and co-author (with Angus Stewart) of Grow Your Own. SESL were the first people to sponsor Mad About Dirt and are providing free soil testing for the Narara Ecovillage’s greenhouse trials. Dr. Paul Harvey: “My passion is in environmental contaminants / pollutants. My business, Environmental Science Solutions, helps to spread knowledge about potential pollutants in our ‘dirty’ world”. Joy Jago is a champion of composting, passionate about permaculture, a productive food-gardener, and a member of the Narara Ecovillage. She will be helping to run the Mad About Dirt event. Margo Parris and her volunteers will show off their work at one of the Narara Ecovillage greenhouses, where they have created five soil beds to compare five different soil preparation techniques. Megan Wallace is developing soil-and-dirt-related activities for children for the day. She is passionate about children’s nature-based education at Narara Ecovillage. Thursday 21st March is the International Day of the Forests and, more cosmically, the Autumn Equinox. That afternoon, Narara Ecovillage member John Seed will lead a walk from the village back-gate into the Strickland State Forest Arboretum. This will be a walk through the splendid Autumn bushland strewn with this year’s bunya nuts but it will also give us an opportunity to drop into the vast scale of the solar system. John will be leading a process called “Earth as Peppercorn” which helps nourish our ecological identity as we construct a scale model of our solar system based on the Earth being the size of a single peppercorn. We will then walk from the Sun to Pluto reverently placing peppercorns and other appropriately sized objects as we learn to feel the scale of our Solar System home. Cost: $15 family, $10 individual, proceeds to the protection of the threatened forests of NSW.We’ll leave the Visitors Centre at 3.45 and the Village back gate at 4pm sharp. Return by 5.30pm. 6pm formal session CEN 3 talks ~15mins: Alf Britten on pigmy possums, Wildlife Arc & CWMWG on our work at NEV including Richard C on birds & boxes. “Kirtan” is a community form of uplifting chanting practice to lighten the heart and perhaps invoke wonder at the divine nature of the cosmos. Everyone is welcome. This is NOT a concert and you’re invited to join your voice to the chant in “call-and-response”… we might even make a Mantra Choir again where the harmony was only matched by the looks on people’s faces as they realized they were responsible for the heavenly sounds and mood filling the room. Kirtan (simple Sanskrit mantra chanting with music) is one of the easiest and safest methods of achieving inner peace which other methods of meditation may take years to achieve. It’s meant to be particularly potent for the current “age of strife” (Kali Yuga) we live in now. Simply join in the energy and rhythm and see what happens! Bring a shaker or tambourine if you like. And a cushion in case we run out! Donations welcome on the door for use of the room. Scilla Sayer explains: At Narara Ecovillage we like to try new things. Last month we celebrated Summer with our first seasonal ‘ecovillage experience’ weekend. It went well and Ecovillage Experience Weekends are now planned for 25/26 May (Autumn), 14/15 September (Winter) and 23/24 November (Spring). The program will include the elements of our tried and tested Open Day format: presentation, tours, questions and a cuppa but with the bonus of an opportunity to get a real feel of ecovillage life through joining activities, sharing meals, exploring the land, learning together and celebrating. Singing an Acknowledgement to Country with the children kicked off a weekend where we all got to know one another better. The program began with facts and figures of Narara Ecovillage history, membership, lot availability and plans for Stage 2. After tours came a talk on ‘green kitchens’, a bunya nut hunting expedition, a sumptuous shared summer feast, inspiring short films and, for a few, a night under canvas. Our sights are now set on our Autumn Ecovillage Experience Weekend. Mark the date (25/26 May), follow us on Facebook and watch the website for more details. A small group of Narara Ecovillage members has been beavering away to transform the area just north of the children’s playground into a food forest. The site has been eroded by water running across the lower road from the Admin building. Efforts to preserve the grand Scribbly Gum on the site and to prevent further soil erosion are being made through the installation of three swales running across site. The swales, on contour, will catch the water to slow down its movement, allowing it to slowly soak into the soil to provide water for plantings. At this stage, a top swale has been installed with overflow channels diverting water through two banana circles. The first bund (soil from digging the swale that is mounded up on the downhill side of swale to form a bund or garden bed) has been planting with three Myrtle trees (lemon, cinnamon and aniseed). Part 1 of three small swales which will run across the middle of the site was completed in January with the help of volunteers at a working bee. Swale 2A has been planted with a Davidson Plum, Moringa, Black Sapote and Burdekin Plum. Plants and green manure crops have been added to both swale bunds to support the trees by attracting beneficial insects, providing nutrients and improving soil structure. Windbreak and habitat trees have been planted along the perimeter of the site and beekeeper member Lincoln’s native bee hive has now made its home on the site. Tiny House Presentation a sell-out! Last Saturday’s Tiny House event, featuring NZ’s Tiny House advocate and actor, Bryce Langston, attracted over 100 people for his 5 hour presentation at the village. His marathon event kept most people spellbound as he spelt out and motivated them on how they could make their tiny house dreams come true with a plethora of useful advice on how to get started, the pitfalls and the rewards of living small. Bryce has a following of 1.3 million to his youtube channel. Afterwards, Tiny House visitors and village members mingled during a community dinner, sharing food, dreams and camaraderie. NB Serious tiny housers may be interested in Sydney Community College’s “How to Build a Tiny House”. The College has partnered with The Bower Marrickville to offer the only comprehensive tiny house building course in the country. Candy’s strawbale wall raising workshop was held mid-February when over 20 natural building enthusiasts, plus several members of Candy’s family, beavered away to raise and render walls, ready for the windows to be installed. Earthship guru, Marty Freney, Earthship Eco Homes in South Australia (also a strawbale doyen), led the workshop and waxed lyrically afterwards! Straw, mud, food and fun, natural building is for everyone! Many hands gets the job done! “Thanks a ton Narara Eco Village, Candy Disch and her son Dave, Sean Bozkewycz, Linda Scott and all the amazing people who wrangled and rendered bales at Candy’s strawbale workshop. Steph & Rob’s strawbale workshop run by Viva Homes over 4 days was well subscribed with 40 people attending from far and wide. Participants participated in bale wall raising, made clay render and applied to the straw walls, as well as rendering the upstairs straw panels. For home owner’s Steph and Rob, catering for over 40 people (including Viva crew) was a challenge well met, with workers appreciative of a range of nutritious food, drinks and treats (the white chocolate brownies are now legendary!). Viva’s Simone was impressed with the facilities they provided which made very important communal meals run smoothly. Last word from Hilary, who travelled from Bellingen on the NSW North Coast for the workshop: “Fantastic experience. Fabulous people to work with, learn with; had fun, ate great food and developed amazing muscles.”! Our resident bird watcher Richard C, says: Gang gang cockatoos have been seen and heard around the property several times this week and last week. Member Rani saw three of them and our timber miller (amongst many other talents) Rob reckons he may have seen six. These delightful birds are some of the smallest Australian cockatoos; the male has a bright red head, the female is all grey. They have a distinctive call like a creaking door. In the last 5 years they have been rare visitors to Narara, but this year they seem to be hanging around. No-one has managed to photograph them here, so this photo is from the excellent website, ‘Birds in Backyards’. Less welcome, but beautiful in continents where it belongs (like Europe and North America), is this red fox, recently seen one afternoon on the middle rural lot, hunting mice or insects on the grass. A Black-shouldered Kite, which may be “Biskit”, the bird that almost became a resident last year, is once again hunting rats at the village. Here it is in the front paddock last week, about to eat a rat. A Square-tailed Kite was recently seen at the village. It’s an endemic Australian species of raptor that used to be rare, but has turned up on the Central Coast in recent years. They look like a small eagle, but have a square-tipped tail (ie not wedge-shaped) and very long “fingers” at the end of their wings. Diamond pythons seem to be on the move at the moment. These great rat catchers are not poisonous and should be left in peace. And don’t keep pet rats, hamsters or guinea pigs- pythons cannot resist trying to eat them! 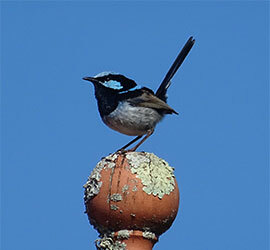 Richard is always interested to hear of your wildlife sightings: cassels@ozemail.com au. He has kept weekly records since July 2013. The tank was an inherited structure on the site when it became Narara Ecovillage, originally built to store water for fire fighting. It hadn’t been in use for many years. The roof was rusted and falling apart but the tank itself was still solid. We joined in November 2014, just as the selection process for the lots commenced. After much discussion, we landed on lot 29 and scored the tank! Although the tank took up a considerable amount of space on the lot (5.5m diameter) we figured we could do something special to make it a feature: possibly cut a piece out of the wall and turn it into a partially covered outdoor entertaining area, etc. Finally, in 2016 civil works commenced across the site to build the infrastructure for Stage 1 and the landscape changed dramatically. The roads and pipes for services went in and the markings of the lot boundaries dissolved into piles of dirt. We always knew where we were going to be because our tank marked our place on the land…but our plans didn’t eventuate, fate intervened which saw us move to Lot 30, one up the hill. Sadly, the new owner couldn’t manage to incorporate the tank into the design for their house, so it had to go. One option was to smash it to a thousand pieces and tip it. It was then that a new plan was hatched! With the help of the site manager and his newly acquired concrete saw, we set about cutting up our tank and taking it next door to adorn our new garden. Down it came piece by piece with the curved walls and the flat floor. What a job!! It was dirty and dangerous but two weeks later it was in pieces and stacked in piles waiting for its final resting place. After building our house and transforming our site, the pieces of the tank have been placed in the garden and now acts as a soil stabilisation tool/ retaining wall/pathway/walls for our future fire pit. Jazz Mozzi says: The people attracted to the ecovillage continue to amaze me. Such a diversity of passions and skills that stretch across all ages. House building has begun and some of our members have become Owner Builders. One person is Linda Scott, the Editor of this monthly newsletter. Linda is 73 years old and is project managing her house build. I asked Linda what brought her to the ecovillage? I’ve been attracted to living in a community after living in the mining town of Mount Isa when I first came to Australia from UK in the 1960’s. It was a tight knit community and was hard to leave. Later I lived in Westleigh, near Hornsby, a small suburb at the time, very social, helping each other with babysitting and great community involvement in a theatre group that I co-founded. Since then, I’d been looking for my community, and I’ve found it! Somehow I ended up on Lyndall Parris’s mailing list in 2006. I was living back in London and attended meetings in Sydney on my family visits back here. My interest in permaculture, love of community and natural building all came together. I could see a future in Lyndall’s dream of an ecovillage’. I was attracted to natural building materials after being roped into a mini strawbale workshop in rural England. I loved it and shortly afterwards attended my first workshop in Spain, building and sculpting a strawbale wall. I was totally hooked! Natural houses are healthy to live in with breathable walls and cosy interiors. The creative options are endless: glass bottle and stain glass, sculpted walls, cordwood and mud floors. I’d be lucky if I found a builder who would take on my project (within my budget). Having attended workshops where I paid for the privilege of learning various skills, I’ve always planned that’s what I’d do with me as Owner Builder. It has taken a chunk of years to get to this stage which is daunting but I’m as fit and healthy as ever, so I mustn’t let a few advancing years stop me! Linda, we find you an inspiration tackling your Owner Builder’s licence and getting a White Card. What does the Owner Builder’s course cover? It’s about being a responsible builder, with a safe worksite, planning the project, subcontracting, insurances, etc. It’s given me confidence. I’ve organised hundreds of events in my life so why not do this? If I get into strife, I’ll ask my community to help me! A few years ago our Natural Building Group visited Ourimbah resident Andrew Duncan’s in progress, strawbale house (incorporating poured earth, rammed earth, etc). Still in progress, much advanced, Andrew invited us last week to learn more about laying mud floors. Andrew, a boatbuilding shipwright, with a Sydney business involved for 20 years in wharf, bridge and floating marina construction/maintenance, is transitioning to spending more time working on the Central Coast. Which is good news for us natural builders as we are always looking for skilled specialists to work with. Last year tens of thousands of school students across Australia took the world by storm when they hit the streets and demanded action on climate change. It was an incredible moment that gave us hope and sent waves through parliament, across the country and around the world. Now the students are asking for us to stand with them when they take to the streets again on March 15, just a week before the NSW election. Help to tell our politicians to treat climate change for what it is: a crisis and the biggest threat to our generation and generations to come. An opportunity for children (and families) to engage in a program that promotes a love of nature, opportunities to observe nature and grow in knowledge, skills and understanding. See you at the ecovillage sometime soon! The Narara Ecovillage project currently comprises two entities. The Narara Eco Living Network Inc. is a not-for profit incorporated association that promotes sustainable living. It serves as a “Friends of the Narara Ecovillage”. Its brief is both local and global. The Narara Ecovillage Cooperative Ltd. Is a Co-operative formed to develop the Narara Ecovillage. Membership costs $30,000, and requires the intent to purchase a lot at the ecovillage and to contribute a minimum number of working hours. The Narara Ecovillage is located at 25 Research Road, Narara, NSW 2250. Happy February everybody! In a week where the world has experienced extreme weather, from a polar vortex in the northern hemisphere to never before experienced heat waves and floods here in Australia, it’s time to keep calm and do things eco! We are especially excited about our quarterly Village Experience weekends, where visitors have the opportunity to stay overnight and really taste life in the village. The first one is on the weekend of 23-24 Feb. For more details, see the story in this issue. At Narara Ecovillage we welcome visitors on the last weekend of every month from January to November. The tried and tested half-day Open Days format give a great introduction. Requests have been made by people drawn to living in our community to spend more time getting the feel of this magical place and getting to know members of the Narara Ecovillage Cooperative – those of us lucky enough to be intending to live here. Come and get muddy making bricks at Narara Ecovillage! So, in the spirit of trying new things, we are extending our welcome in 2019 with four Village Experience Weekends. In line with the seasons, we will open up our land each quarter: 23/24 February, 25/26 May, 31 August/1 September and 30 November/1 Dec.
Have a look at the Program for our first Village Experience Weekend. It shows the ‘flow’ from a structured first day with presentation, site tour, Q&A, information session and the specialist tour etc to a more community-focused day on Sunday when visitors are welcome to join us in what we are already planning to do that day from Tai Chi to chai tea; weeding to wandering in the forest. The cost is $25 per adult. Kids are free and there is a $10 discount for NELN members and concession card holders. If you come only on Sunday, your help will be your contribution at no extra charge.Camping and one specialist house tour have additional costs. Registration for camping is essential as places are limited. Booking for the weekend is helpful: https://summer-2019-village-experience-weekend.lilregie.com. Want to Try Your Hand at Straw Bale building and Natural Plastering? Read on and save 50%! The next workshop at Narara Ecovillage, run by the fantastic team from Viva Living Homes, has been scheduled for 7-10th March, 2019. Over four full days, participants will get the opportunity to install straw bale infill walls and prepare them for rendering, take a look at prefabricated straw panels, build cob internal walls, and learn the art of earth, clay and lime rendering of internal and external walls. The design process was anything but simple. With a steep block in a bushfire zone and a limited budget, multiple variations were explored before a compact two-storey design was chosen. Incredibly the house has obtained an 8.5 Energy Star Rating! Come experience for yourself how it’s done, get your hands dirty and have fun alongside great people. These workshops are fantastic value, normally $120 for four days including lunch, morning and afternoon tea. But NEV and NELN members are offered a 50% discount off this price! Hope to see you there! Simply follow the link below to book and use the discount code NARARA50. Leading a great line-up will be Tino Carnevale of ABC TV’s Gardening Australia. A Tasmanian, his lifelong interest in plants and gardening stems from growing up on his family’s small vineyard and olive grove. He is involved in the Feeding the Future Coalition, is part of The Stephanie Alexander Kitchen Garden Program, teaching students at Moonah Primary School, and is a patron of the Tasmanian Weed Society, an organization that raises awareness of environmental weeds and their impact. Angus Stewart was once known on radio as “Doctor of the Dirt, Surgeon of the Soil, Professor of the Paddock”. His first horticultural job was at the Narara Horticultural Research Station, now the Narara Ecovillage. His latest book, Grow Your Own – How to be an Urban Farmer, is co-authored with Simon Leake. Angus is really looking forward to presenting his latest work on small and large scale worm farming to reduce organic wastes going to landfill, whilst encouraging people to create their own free fertilizer and compost to grow their own food. “And I look forward to sharing our community garden results with everyone”. Kerrie Anderson, Permaculture educator, will be one of several speakers to highlight educational opportunities for school students in areas related to soil, horticulture and permaculture. Organisers of the Network’s Mad About Dirt event are now inviting applications from individuals and organisations that would like to promote their services. Co-organiser Joan Cassels said they were particularly seeking those who offered educational course, workshops, qualifications or careers related to horticulture, permaculture, soil science and soil conservation. If you are interested, please contact the organisers by email as soon as possible as places are limited: madaboutdirt@iinet.net.au. The need to travel is a practical reality for us all, but our expectation to be able to travel when and how we wish is symptomatic of the unfettered social and economic growth models we have inherited. Most travel modes remain dependent upon fossil fuels usage with our habits continuing to contribute to ‘climate crisis’. This evidence is reinforced by the October 2018 IPCC Report. Ecovillage members have endorsed a duty of care to respond creatively to the way we travel, challenging our behaviours and supporting alternatives to fossil fuel modes of transport at the global, national and local levels. In response, our local GTP has been developed by our Green Transport Working Group and is intended to provide the strategic travel policy framework our ecovillage for the next 10 years. The following targets were developed through responses to a comprehensive Green Transport Members survey in September 2018. Target 2: Reduce total private car ownership by NEV members by 35% within 5 years. Target 3: NEV members to increase ownership of electric / hybrid cars, by 240% within 5 years. Target 4: Reduce the proportion of visitor trips to NEV that use private car (fossil fuel powered only) by 50% within 5 years. The GTP is at ‘second draft’ stage with adoption expected in April 2019. The GTP will be supported by a Green Transport Charter of greater scope including challenging our wider travel habits nationally and internationally. Lyndall Parris reflects: “I feel more secure here. If something untoward happens, we would call a meeting in our village hall and many good brains would turn up. We would hear from people from all walks of life with multiple perspectives. We would work a way forward together. It is rich seeing the beehives at Narara and watching our chooks preparing the ground for a vegie patch. Parents get help during the school holidays from others offering their time, expertise and effort to give Narara children some fun and learning. When I pick up some rubbish, help make a meal, assist with an event, propagate figs, I feel that I am contributing to the joy of my neighbours. I feel expansive and generous. When I have an idea, I can immediately think of someone to chat to about this. The variety of outlooks and skills at my fingertips is massive. At a community pot-luck dinner, I can collect my plate and fill it with such a variety of delicious, food, while at home the same time in the kitchen holds less reward for effort. On very hot days, I can choose air conditioning…or a cool walk in the adjacent and oldest rainforest arboretum in NSW. It is minutes from our boundary. Green Magic Homes – A tiny house underground! Now operational in Australia, Green Magic Homes structures are covered by soil and rich greenery, making them energy efficient and energy saving while keeping a temperature balanced interior that fosters restful sleep and rejuvenation. Embrace an innovative lifestyle that calms your senses, fills you with energy, joy, and inner peace while keeping you connected to your external environment. Congratulations to Geoff and Liz on their new house, and to Builtsmart on the successful installation on a very hot day! Amazing that in the morning there was no house to be seen, and by lunch there was a 2 storey home installed! The NSW coastline from Newcastle, through the Central Coast to the Northern Beaches of Sydney (PEP 11), has been opened up for oil and gas exploration and extraction. This plan has been imposed on our beautiful coast by the Federal Resources Minister Matt Canavan, without adequate community consultation and despite opposition from the NSW Government. Newcastle City Council and Central Coast Council are also opposed to this dangerous plan. Their adverse effects on marine life are well-known and we cannot let this plan proceed. More information. An independent candidate, David Abrahams who is contesting the seat of Robertson against current sitting member for the LNP, Lucy Wicks put together this video to inform constituents. In an Australian first, on Friday 8th February, the NSW Land and Environment Court rejected the Rocky Hill coal mine near Gloucester, on social and climate change grounds. The court has effectively ruled that coal – just like tobacco and asbestos – is bad for us! The chief judge of the court announced that the proposed mine was “in the wrong place, at the wrong time.” Dr Annika Dean, Senior Researcher at theClimate Council says: “We couldn’t agree more. In fact, there is no place for any new fossil fuel projects”. She said Climate Council’s Prof Will Steffen gave expert evidence in the hearing, providing compelling statements about the climate change implications of the mine. “This is the first time in Australian legal history that a court has considered the global carbon budget, climate impacts and the Paris climate targets”. This outcome is a game-changer and a huge win for Groundswell Gloucester and the Environmental Defenders Office of NSW who argued on their behalf. Today, the law now confirms what the science has been saying for a long time. Welcome to 2019! And the village is really taking off! Our 9th house has been DA approved and about to break ground, with 6 houses completed or under construction. We’re planning some pretty special eco-events for 2019, including “Mad about Dirt”, a festival of all things soil, on 11th May, and Sustainable House Day in September. But no need to wait that long – there’ll be opportunities to check out several beautiful sustainably-designed houses through the year, starting on 26th January Open Day, when Candy’s earthship (under construction) is open for tours. During the year, you’ll also have the chance to participate in owner-builder workshops and learn some hands-on natural building techniques. In food news, the Village has an energetic Food Production Working Group, who are setting up one of the greenhouses and will be trialling comparison approaches for improving the soil, including using mushroom compost, the Ruth Stout no-tillage approach, green manure, and compost from our new Chicken Tractor. Candy is the owner builder of Lot 2 and is constructing an Earthship. Wikipedia: An Earthship is a type of passive solar house made of both natural and upcycled materials such as earth-packed tyres, pioneered by USA architect Michael Reynolds. She has agreed to allow small tours of 10 people (at a time) entry into the semi-built structure and will explain the principles behind the Earthship model. She’ll point out her own unique features that will be incorporated. Are You Mad About Dirt? obsessive about growing your own, healthy, food? a campaigner for soil conservation and against industrial soil stripping? fascinated by the soil biome – the microscopic life in soil? a mud-brick /rammed earth/ strawbale/ hempcrete home builder? or you just love mud? Then you certainly won’t want to miss Mad About Dirt, on Saturday 11th May 2019 at the Narara Valley High School and Narara Ecovillage! Mad About Dirt is a day dedicated to celebrating and discovering all about “dirt” (especially soil). Soil is the miraculous carpet of life that covers much of our planet – yet we often treat it – “like dirt”! Soil is the one ecosystem that we absolutely rely on for our very survival, yet it’s perhaps the least appreciated ecosystem on Earth – why is that? Do you wonder why every child loves dirt, and why gardening makes you happy? Free admission (thanks to Central Coast Council, Bendigo Bank, SESL Australia, Viva Living Homes and Narara Eco Living Network). Contact: madaboutdirt@iinet.net.au Mobile Richard 0400 601 668. Tony and Teresa Farrell say: “To have an energy efficient house in our climate it’s important to reduce as far as possible hot or cold drafts coming into the house. Hot winds on hot days or cold winds on cold nights can have an enormous effect on the comfort of the internal environment of the house as they infiltrate through gaps in the envelope of the building. If you can keep the outside air out then it enables you to have better control of the air inside. This can be done using products like breathable wraps, sealed window and door surrounds, and appropriate windows and doors. The effectiveness of the seal of the house can be tested with the blower door test, where everything is closed up and a large fan is fitted within a sealed doorway to create a pressure difference between inside and out. The air leakage can then be measured and gaps found. This is an important principle in the ‘passive house’ system which is gaining popularity in Australia. Although our house wasn’t set out to be a ‘passive house,’ we have used many of the principles of the system in our building. Our architect, Andy Marlow, of Envirotecture has organised an expert to come to the village to test our house for us. He is also keen to make this an education opportunity for others to come along and find out the different ways to achieve a well-controlled internal house environment. This year will see even more homes starting or being completed at the village; there is much excitement in the air! Who would have thought trucks ‘n’ tradies, cement mixers, fencing, noise and building would resonate with so many people! So what’s next? The Earthship was showcased in the December news and is now has a roof on! A strawbale workshop will be happening soon. The second home is almost completed, a lovely natural build by Viva Living Homes. One of our members said ‘All I want for Christmas is a concrete slab’ and she got it! We have two homes with slabs ready for framework. Four more lots have construction fencing around them. Cluster units – Coastal Constructions will build this 18-unit development for Narara Ecovillage Co-operative and anticipated completion is before the end of the year. Price range of available units: $390,000 to $476,000. And in anticipation… a cute little raised garden bed has sprung up on this lot before the home is built. Samantha Graham (Education designer and much more: visit her website https://stateofmind.sydney/), says “I’m wondering if any of you are interested in coming to this festival of social change/sustainability 19-24th February just outside of Hobart or know who else might be keen and could pass this on? I’m a presenter and as you’re a subscriber of Network News, I’m able to offer you a 20% discount using ‘StateofMind’ when you book”. Newkind is an annual conference for anyone ready to step up, find their purpose, and make a positive impact on the world. If you have a strong desire to champion social and economic justice, establish equality, defend diversity and facilitate the process of peace-building, then Newkind is for you. Through inspirational discussion panels, workshop sessions and thought-provoking lectures by academics, activists, entrepreneurs and social justice advocates, the Newkind conference is designed to empower and inspire you to become the change maker you want to be. Thought leaders from the fields of education, economics, environmental protection, business, sustainability and social justice combine to create a powerful convergence for cross-disciplinary conversation. So come, be inspired, and get connected with a community of leaders, pioneers and agents of social change. It’s so good to see your eco village dreams taking shape, and though I now watch from a distance (Brisbane), I do share your extraordinary journey, in spirit. I’d been involved in NEV since early 2011 but had to walk away in 2018 for health reasons. However, under the right circumstances, I could return. In the meantime, I’ve channelled my eco village enthusiasm into the online environment via The Local Resilience Project which I kick started in at The Apple Store in London late last year. The Conversation: ideas for meaningful conversations about the threats to our resilience e.g. climate change, financial indebtedness, shrinking biosphere and so on. The Checklist: 100 Yes-No questions across 12 areas of life to create an inventory of your current household resilience with links to resources to help boost your score. The Call To Action: An invitation to make behavioural changes to boost your resilience through (i) personal habits e.g. shopping at farmers markets and (ii) community initiatives e.g. Town Hall Meetings to meet ‘experts’ in the 12 areas of The Checklist. Ideally, The Local Resilience Project will be ‘exported’ to postcodes across the country, given the right kind of exposure and interest. The website is:www.localresilienceproject.org and you can visit right now to take The Checklist. I welcome your thoughts and questions and can be contacted at lsgillett@gmail.com. Go well with all your wonderful eco constructions. The death of a New Zealand man last year after contracting Legionnaires’ disease has his friends asking whether the warnings about the dangers of potting mix are strong enough. According to family and friends, he was well aware, as an experienced gardener, of the recommended safety measures when handling potting mix. He would split open the bags and use the hose to wet them down well, then leave them exposed to the air before using the mix. He wore gardening gloves, but no mask. Bacteria can easily grow in potting mix. Legionella longbeachae is one species that breeds in the warm, moist conditions inside the bags. Inhaling the spores can cause Legionnaires’ disease, a potentially fatal form of pneumonia that can be more easily contracted by older people, particularly if they have existing health conditions, poor immunity or chronic illnesses. Friend of the village, Liz Stride is delighted to announce that Silencito Pilates & Meditation Studio has opened in Narara and would like to offer NELN and NEV members a free one hour Initial Consultation and 10% off package prices. Silencito is a fully equipped Pilates studio with high quality equipment. Pilates tuition includes private classes, intimate groups (max three people) and mat classes (up to six people). Meditation classes have a maximum of six people. Free demonstration of “Zumba Gold” at Narara Ecovillage Visitors Centre, 25 Research Road, Narara, NSW 2250. When: 9.30-10.15 a.m, Saturday, 19th January 2019. Come along, join in or just watch! No previous experience necessary. Haruko Eaton runs Zumba classes at Wyoming for seniors on Friday mornings (“Zumba Gold”), and for the very active on Tuesday evenings. This demonstration is to see how much interest there might be in holding Zumba classes at Narara Ecovillage in 2019. Zumba combines music, dance, both physical and mental exercise and much laughing. The music and moves come from all over the world- Cuba, Italy, India (Bollywood), the USA and many others. Children are welcome to join in. Loose clothing and “gym” shoes recommended! The venue is air conditioned, and water drinks are available – or bring your own. Hosted at NEV by Zumba Gold enthusiast Richard Cassels! This overhead shot shows how even the smallest green spaces are being eroded. Residential areas (like these in Perth) have gone from tree-lined lawn to concrete and brick right up to the boundary. Local planning regulations often allow patios, hard verandas, and paved parking to be called “open space”. So it’s good news for us as well as the planet. If you’re in Sydney, take a detour to the beautiful Paddington Reservoir Gardens , created out of a disused urban site, for inspiration. Your green space doesn’t have to be that grand – a tree, some shrubs, and a seat in the shade will do just fine. Vertical gardening is a great way to incorporate the great outdoors within urban spaces. When planning your vertical garden, consider the sunlight requirements of each plant. Design your garden with the most shade tolerant plants placed towards the lowest section. We’ve created a selection of our favorite tube stock plants best suited to vertical gardens. According to an article in The Guardian, global warming of oceans is now equivalent to an atomic bomb per second. Every time you start a petrol engine, switch on coal-fuelled electric power, or use any manufactured product, you are contributing to the vast release of energy by burning fossil fuels. Thanks to a human population of 7.5 billion, global emissions are now estimated at the equivalent of AT LEAST one atomic bomb per second. Now for something lighter! Sing your heart out! Looking forward to seeing you at the village!